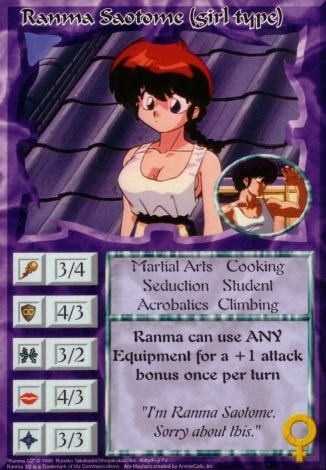 Ranma 1/2 was the main reason I got into Ani-Mayhem, so I will begin with a review of the anime's protagonist, Ranma Satome. At first glance he is a little above average, why Akane has better stats than him I'll never know. Statwise, he is pretty solid in his male form except his 2 Movement and his female form is sitting pretty on everything but Attack. The extra Charm and Movement can sometimes be worth transforming for. After taking a second look you can see he has some more to offer. 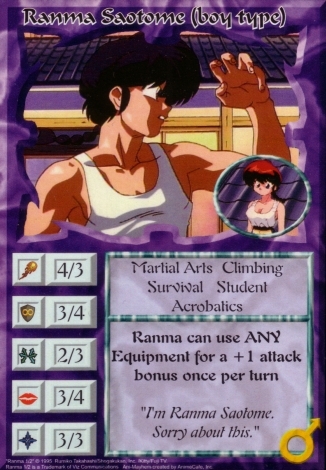 Ranma boasts a pretty good number of skills and most of them are very relevant inside and outside of Ranma 1/2 decks. And we cannot ignore his effect, which gives him a +1 to his Attack if he is using Equipment. Here is where Ranma can inch out of average and be a decent secondary attacker. I recommend either putting a Bubblegum Crisis battle suit or a Muldoon artifact on him. This will put him at 5 Attack and 4 Defense and allow him to bump up to a 6 Attack once per turn. Additionally if you put a hardsuit on him, you fix that Movement problem and given him a useful Strength or Flying skill. It's a small combo that is easily achievable in a real game. While neither Equipment is anime accurate or makes him a top tier Character, he does become a useful team member your opponent can't completely ignore.